The Telrad finder is what's known as a "reflex" finder. This means that when you look through the finder, the sky is not magnified. It works much like a red dot scope for a rifle or a jet fighter's heads-up display, and projects three concentric rings on the sky. The rings are 0.5, 2, and 4 degrees wide, respectively. This can be useful as a star-hopping tool, when using the Telrad maps. 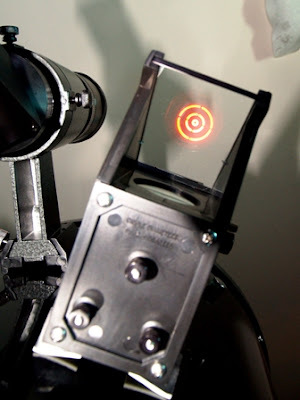 Every telescope, big or small, should be equipped with a Telrad in addition to a good finderscope. The Telrad gets you "in the ballpark" with a correct image (i.e. up is up, down is down) and no magnification. As many experienced astronomers know, the Telrad is more of a necessity than an accessory. 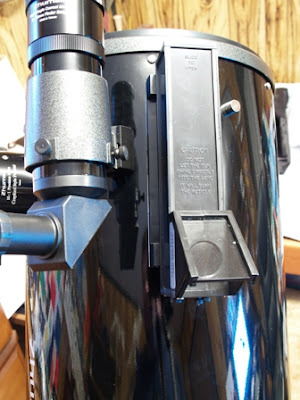 The Telrad mounts to the telescope using a supplied base. It is then mounted to the OTA (Optical Tube Assembly) using supplied double-sided sticky tape. This stuff is permanent once installed, so choose a good location. Extra bases are available, so sharing a Telrad between two scopes is possible. The best spot I could find on the Zhumell is shown above. Some people notch the base and put the Telrad between the finderscope and the focuser, but I believe that breath from your nose could fog the Telrad while using the finderscope. Note the three concentric circles. The three knobs on the Telrad, visible here, are for aiming the Telrad, just like you would for your finderscope. If you sight your Telrad in well enough, when you put an object in the center of the Telrad sight, it should be mostly centered in your eyepiece. The Telrad is one of the best finder solutions on the market currently. It is simple, relatively cheap, and makes locating objects via starhopping much, much easier. Try one and you'll be hooked! I did this project tonight. I've had the Telrad for about a month but just got around to actually attaching it. It really is cool! And, it makes finding things so much easier. Anyway, great addition. I bought mine about 2 weeks ago. This made it so much easier to find what I was looking for. So much I just took the scope off my 10" dob. I would suggest everyone to get one. Just bought one for my 8" dob, can't wait to try it out! In reimbursing the credit, loaning firms enable the customer to pick the term of installment. Along these lines, you would have the capacity to meet your installments in your own particular terms. It would likewise be less demanding for you to reimburse the advance.